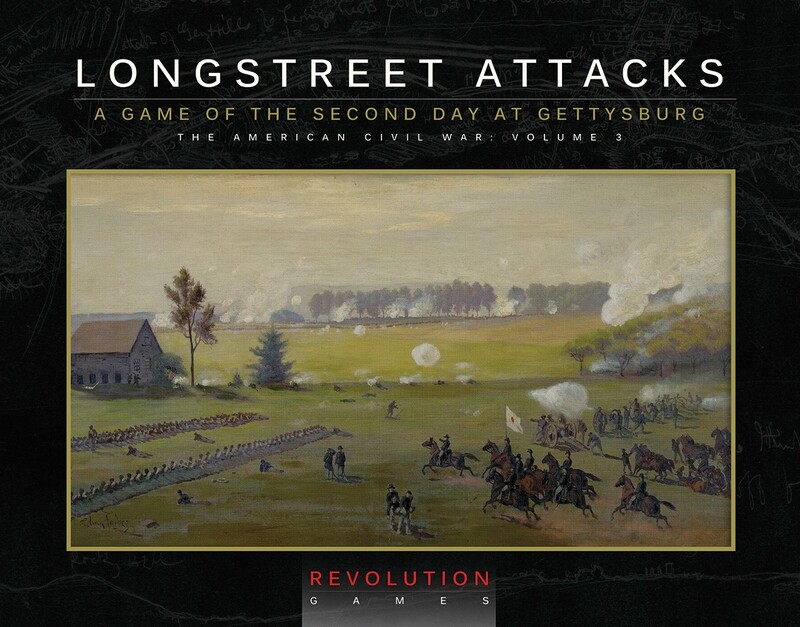 “Longstreet Attacks: The Second Day at Gettysburg” is the third volume in Revolution Games “Blind Sword” Civil War system. 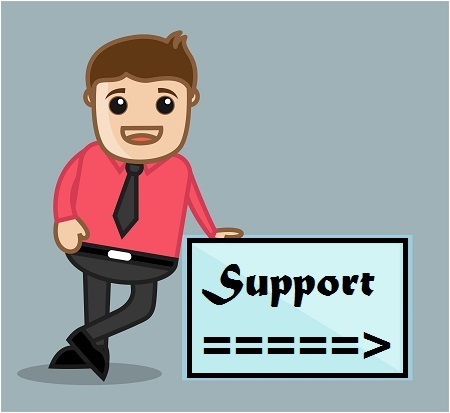 It was designed by Hermann Luttmann and developed by me. Rick Barber was the artist. 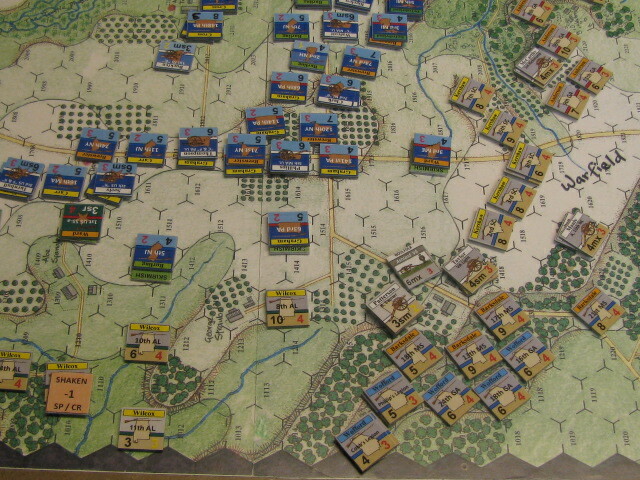 This picture was taken by Bob DeMaio during one of our playtests. It shows the Confederates advancing against the Union’s left flank on the second day. This is the same game as GMT’s “Hammerin’ Sickles.” It will be published around September of this year. It’s maneuver elements are regiments. And anyone familiar with the first two published games in the series “Stonewall’s Sword: The Battle of Cedar Mountain” and “Thunder in the Ozarks: The Battle of Pea Ridge” should have no problem in picking it up. 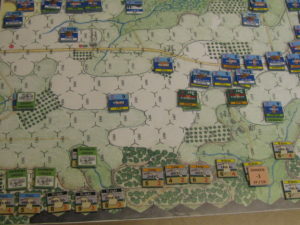 This picture shows the Confederates advancing on The Peach Orchard. 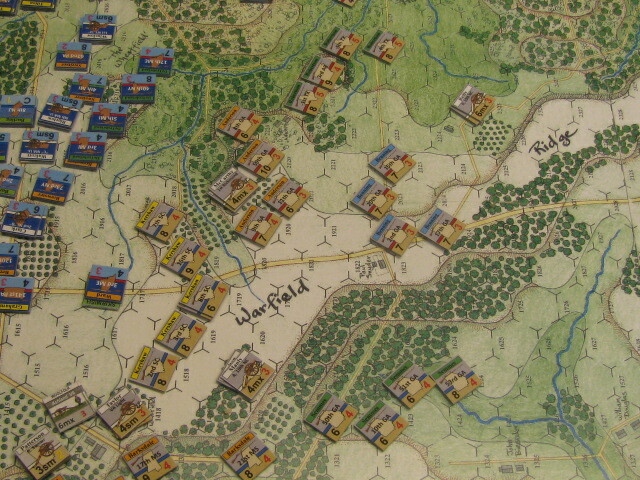 Another picture of The Peach Orchard being attacks from two sides. 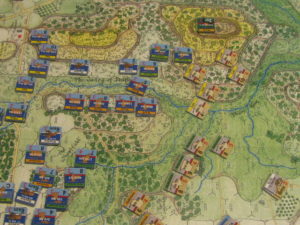 The “Blind Swords” system uses a chit pull mechanic interspersed with event chits to simulate the chaos of war and the problems with using a 19th century chain-of-command. In this picture the Confederates are advancing on Devil’s Den, which is off the picture to the top. 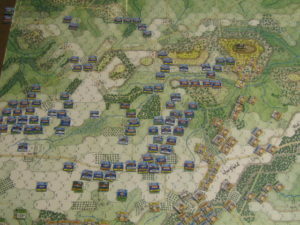 The Union line can be seen to the left in The Wheat Field. 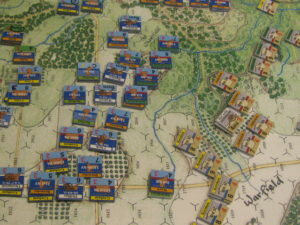 The finished game should come with 4 scenarios: The campaign scenario, a Little Round Top scenario (the small scenario), The Peach Orchard and the defense of the Emmitsburg Road scenario and a “What-If” scenario where Dan Sickles doesn’t advance. The top third of this picture includes Big Round Top, the Valley of Death, Devil’s Den and Houck’s Ridge. The Union is holding Big Round Top at this point. 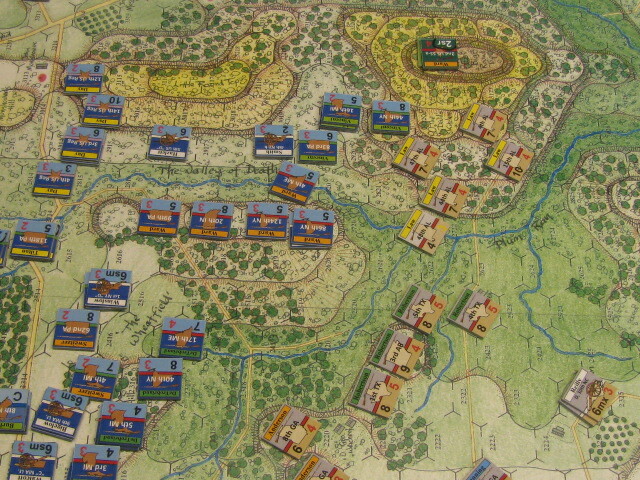 The map and the playing pieces are playtest versions only. This is a shot of the Union rear area along Cemetery Ridge. The game is in final playtesting right now and will be shown at Consimworld Expo in Tempe by Roger Miller, the publisher and at Origins, in Columbus Ohio by Hermann Luttmann, its designer over the next few months. I’ll be at Origins also. 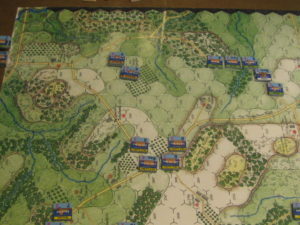 Another picture of the Confederate advance against the Union line that ran from The Peach Orchard, through The Wheat Field and to the Devil’s Den. The Union is still holding The Stony Hill in this picture.